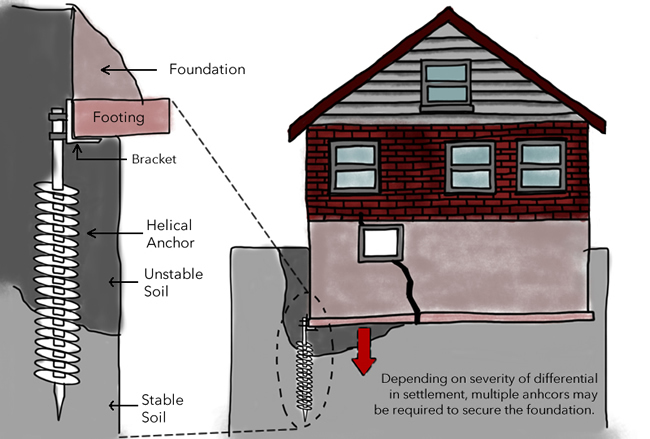 Cracked foundations are very common in the Southeast, especially in Charlotte and throughout North and South Carolina. Common causes are expansive soils, poorly compacted backfill soils and poor drainage. If your foundation is settling, you may see cracked brick, cracks in the mortar or separations at windows and doors. Cracked foundation repair is a home maintenance project that should not be ignored. In some cases, we may install a micropile underpinning system. Like the helical pier system, a micropile system works to stabilize your foundation. It is used in certain soil or loading conditions, or when very high load capacities are needed. Micropiles are commonly used when we encounter rock in the soil strata. It’s common to use micropiles in Asheville, Boone, Blowing Rock and other mountain communities in the Carolinas due to the rocky terrain. You’ll often hear the phrases “helical piles,” “helical piers,” and “helical anchors” used interchangeably. However, they’re not precisely the same. A “pier” is typically a helical foundation system loaded in axial compression, while an “anchor” is usually loaded in axial tension. The first step in getting foundation cracks repaired is to contact the best, licensed foundation repair contractors in the southeast and schedule a site evaluation at your home. A Foundation Repair Services technician will visit your home, inspect the damage and evaluate the soil condition, grading and other factors. Your home is your biggest investment, so we make it a priority to put your home back on a firm foundation … quickly!